Visakhapatnam, March 22: Telugu actor and Jana Sena leader Pawan Kalyan, who is making his electoral debut in next month's Andhra Pradesh Assembly polls, has declared assets worth over Rs 52 crore. The actor, who filed the nomination from Gajuwaka constituency in Visakhapatnam district on Thursday, also revealed that his liabilities were to the tune of Rs 33 crore. Kalyan, in the affidavit submitted to the Returning Officer along with his nomination papers, mentioned that his movable assets including bank deposits, vehicles and jewellery were worth Rs 12 crore. He had Rs 4.76 lakh cash in hand while his wife Anna Lezhneva had Rs 1.53 lakh cash. The 50-year-old, who is contesting from two Assembly constituencies - Bhimavaram and Gajuwaka, revealed that his immovable assets were worth Rs 40.81 crore. His income during 2017-18 was Rs 9.60 crore, down from Rs 15.28 crore in the previous year. Kalyan showed professional fee as hero in the films, agricultural income and interest on bank deposit as the sources of his income. 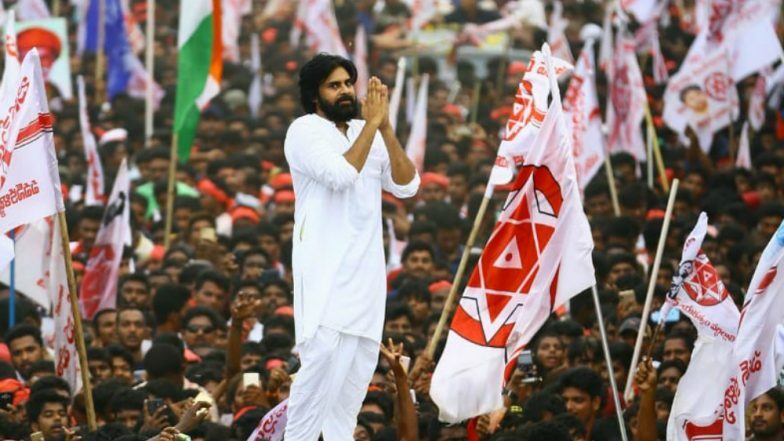 Lok Sabha Elections 2019: Pawan Kalyan's Jana Sena Party Releases List of 32 Candidates for Andhra Pradesh. The actor's fleet of vehicles include Mercedes Benz R Class, Toyota Fortuner, Skoda-Rapid, Mahindra Scorpio, Volvo XC-90 and Harley Davidson-Heritage soft-tail, all valued over Rs 2.75 crore. He owns 18 acre agriculture land near Hyderabad worth over Rs 5.70 crore while non-agriculture land in Hyderabad and Guntur is valued at over Rs 33 crore. Lok Sabha Elections 2019: Jana Sena Chief Pawan Kalyan to Contest Polls From Gajuwaka, Bhimavaram Seats in Andhra Pradesh. The actor, who showed his educational qualification as 10th pass, owns a flat in Banjara Hills, Hyderabad valued at Rs 1.75 crore. His wife has one-bedroom apartment in St Petersburg, Russia, worth Rs 40 lakh. Kalyan has shown his liabilities at over Rs 33 crore that include bank loans and personal loans from film personalities, production houses and family members.